We publish our apps for iPhone/iPad, Android and Kindle on the iTunes Appstore, Google Play, Amazon Appstore and Samsung Apps . It does as it says on the packaging! Feudfraud makes you the smartest player. This great little helper in a world wide feud inspires your play, improves your vocabulary and mercilessly annihilates your opponents! 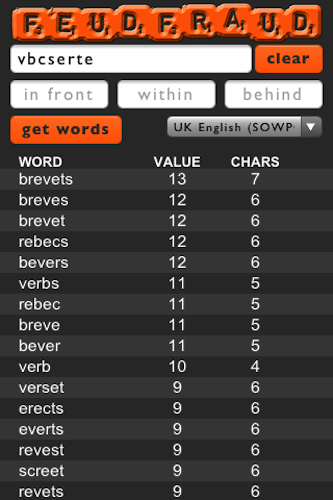 When you are lacking a little inspiration or when you're dealt really lousy tiles, Feudfraud helps you find the longest, the smartest and the most valuable words in UK English (SOWPODS), US English (TW06), Dutch, Swedish, Norwegian, Danish, French and Spanish. 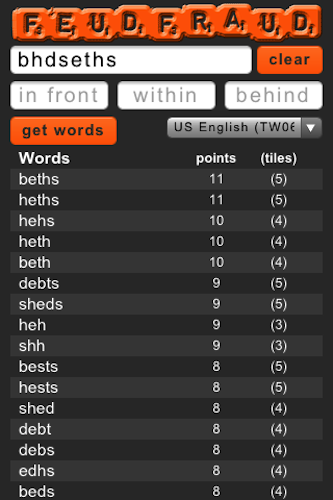 The app contains wordlists continuously updated by our users at feudfraud.com. This free app is fully functional, you may purchase the paid version to remove the advertising banner. A bit from yourself and a bit of cheat from Feudfraud: you're the winner. We love making apps that work, and we do not like and thus do not adhere to pre-determined structures or formatting. We even don't look that much at work created by our competitors. We do look at apps as users and yes: we do listen to their feedback. Top Notch!! What can I say. 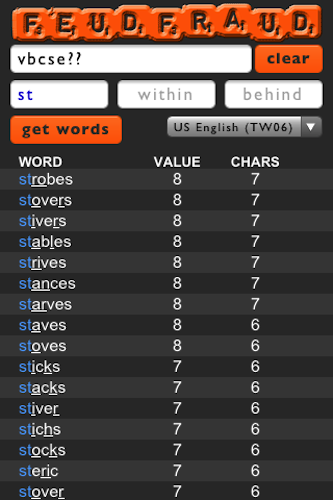 Not only does it help make the game more exciting it teaches new words. Try it you'll love it !! . 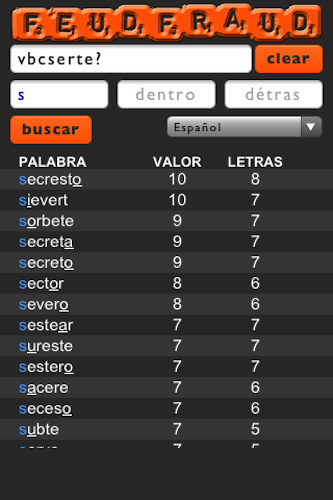 Nice aps,easy to use and it is not complicated like other.Thanks! this by far the best one!!!! I have tried many others & this one is freakin AWESOME!!!! U WILL NOT B DISAPPOINTED!! !